Rachel Lockyer is under investigation for murder. It is 1649. King Charles has been beheaded for treason. Amid civil war, Cromwell's army is running the country. The Levellers, a small faction of political agitators, are calling for rights to the people. And a new law targeting unwed mothers and “lewd women” presumes anyone who conceals the death of her illegitimate child is guilty of murder. Rachel Lockyer, unmarried glove maker, and William Walwyn, Leveller hero, are locked in a secret affair. But while William is imprisoned in the Tower, a child is found buried in the woods and Rachel is arrested.So comes an investigation, public trial, and a cast of extraordinary characters made up of ordinary Londoners: gouty investigator Thomas Bartwain, fiery Elizabeth Lilburne and her revolution-chasing husband, Huguenot glover Mary Du Gard, a lawyer for the prosecution hell-bent on making an example of Rachel, and others. Spinning within are Rachel and William, their remarkable love story, and the miracles that come to even the commonest lives. The mid-seventeenth century was not an easy time for women. Women had no legal status other than property of their husbands or fathers. To make matters worse, the government had passed a law that accused any unwed mother of murder if her child died during or shortly after childbirth and no witnesses were available at the birth. Rachel is in her mid-thirties and has suffered the hanging death of her younger brother. Her mother is a staunch Catholic and offers no respite to Rachel during her pregnancy. Rachel does her best to conceal her pregnancy, even going so far as to claim her swollen abdomen is a result of a digestive ailment. The father of her child is her lover, William Walwyn, a married man with fourteen children. Unfortunately for Rachel, she delivers her child in privacy and then conceals the infant's death. Her boss, Mary Du Gard, witnesses Rachel's burial of the child, digs the child up and becomes the cause of Rachel's arrest. The ensuing investigation is clearly one-sided in that the government doesn't allow Rachel to have legal counsel and does little to ascertain the circumstances of the death. The tragedy of the infant's death is compounded by Rachel's imprisonment and subsequent trial, as well as her continued separation from William. 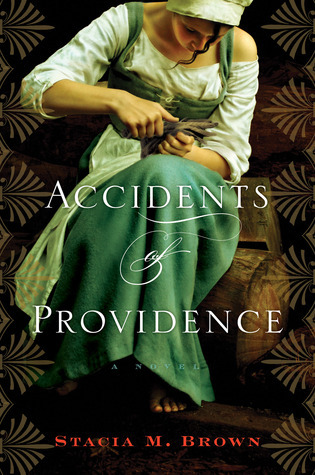 Accidents of Providence provides a stirring portrayal of a prohibited romance. Ms. Brown has provided characters that are completely realistic in their thoughts and actions. Although women weren't given much status in the eyes of the government and society, most of the women are portrayed as strong and intelligent counterpoints to the men. Accidents of Providence may not provide a happy ending, but it definitely provides a heartwarming romance that transcends all societal limitations. That was a great review. I am not an avid fan this kind of book but it looks interesting. Looking forward to read about it.